Cygames and Nintendo have given us a short preview of what to expect for the games latest new content! Void Battles, a new form of dungeon/boss will be arriving at the end of this month! One day, a call for help from a neighboring city reached the Prince and his companions. Atrocious fiends were appearing, including monstrous dragons transformed by the effects of black mana, and they were wreaking all manner of havoc! Void is a collective term for fiends that have been transformed by the effects of black mana, or dragons that have been corrupted and lost themselves due to it. You’ll face powerful boss enemies in these event quests. If you defeat them, you can earn materials for crafting weapons or trading in for rewards. You can challenge Void Battles anytime, regardless of the day of the week. However, the boss enemy that appears will differ based on the day. You must clear Ch. 7/5-6 (Normal) of the main story to participate in Void Battles. You can use the current Valentine’s Confections story event to help yourself clear chapter 7 of the main story! The next update is scheduled for Feb 18 22:00. 2019(PT). Void Battles are scheduled to start Feb 21 22:00, 2019(PT). Be sure to clear Ch. 7/5-6 (Normal) of the main story so you’re ready! As if its Disperse ability wasn’t enough, its area-of-effect attack applies the paralysis affliction. That’s a fierce one-two punch! This powerful enemy harries its opposition with the Dull ability, which greatly decreases strength. Zephyr has been corrupted by black mana, and attacks using the Dull and Dragon Delay abilities. The Dragon Delay ability greatly reduces the dragon gauge! The weapons you can craft using materials obtained by defeating these boss enemies have powerful abilities such as a series of Bane abilities that increase damage against certain enemies. You can craft multiple weapons with materials obtained by defeating the Steel Golem, including those that grant the Physian’s Bane ability, and those that grant Dull Resnwhen enhanced. You should be able to put these to good use when challenging other boss enemies, too! And the weapons you can craft with materials obtained by defeating Void Zephyr grant the Skill Prep +X% ability.. But what do you suppose you might get when you enhance them? You can trade the materials gathered by defeating boss enemies for various items in the Treasure Trade. 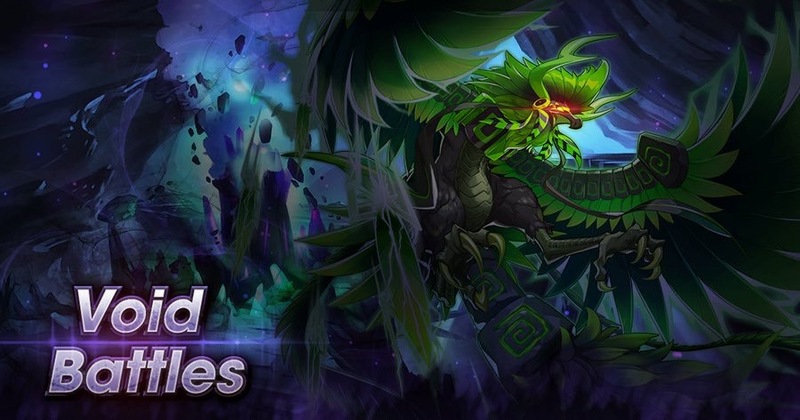 The Treasure Trade for Void Battles contains special items such as the Magma Slime Statue facility, which the stats of flame-attuned adventurers, and the Bronze Fafnir dragon, which has an ability that boosts adventurer EXP.